Tiny Elberta, population 372, is located on a small peninsula, surrounded by Lake Michigan to the west, Betsie Lake to the north and Betsie River to the east. Anchoring the village to the south is a towering ridge that rises almost 260 feet above everything else. A big dune in a little town overlooking a spectacular beach. Long used by locals as a recreation area, the tract was purchased by the village of Elberta, with assistance from the Grand Traverse Regional Land Conservancy and a grant from the Michigan Natural Resources Trust Fund, in 2010. 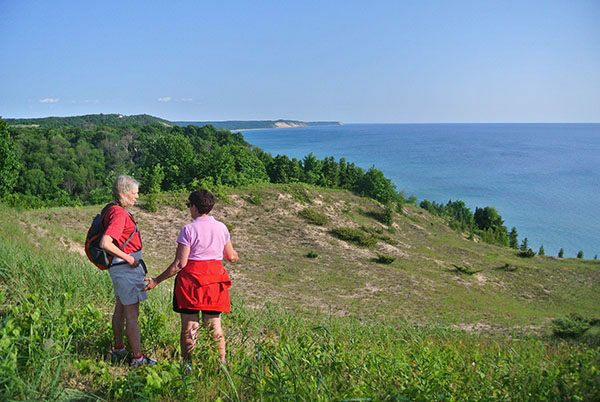 The following year Elberta Dunes South Natural Area was dedicated as a 58-acre preserve. 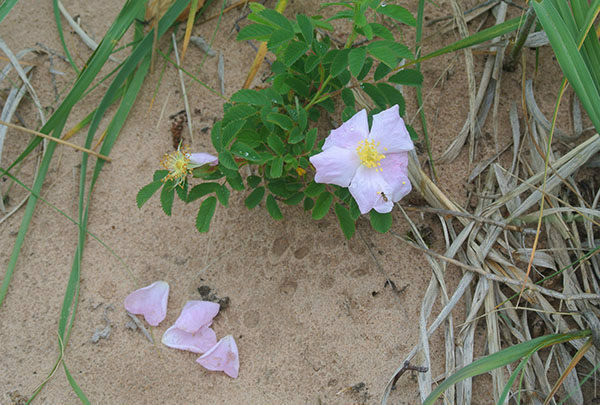 Squeezed between M-22 and Lake Michigan, Elberta Dunes South is not big nor is its trail system extensive, a mere half mile or so. But the area is spectacular. Its western boundary is 1,425 feet of Lake Michigan shoreline that leads to another 1.2 miles of undeveloped beach to the north. Between the wide beach and the state highway are fields, forested ridgelines and an 845-foot dune with slopes that exceed 60 percent. Elberta Dunes South is both beautiful and rare. Almost three-quarters of the preserve has been classified as a Critical Dune Area by the State of Michigan. Within its boundaries is the federally-listed threatened Pitcher’s Thistle and the Lake Huron Locust, a state-threatened insect, while endangered Piping Plovers use the shoreline for nesting. Though a number of social trails crisscross the area, the preserve’s only dedicated trail is well marked and easy to follow. But not especially easy to hike. The 0.6-mile, point-to-point trail climbs steeply in places until it reaches the crest of the dune to reward visitors with magnificent views. In the winter, it is an excellent destination for snowshoers. From the parking area, the trail heads west across a field as a mowed lane. After crossing another mowed lane, the trail from the Lincoln Avenue trailhead, you enter the woods and begin climbing. The trail heads north and quickly reaches the edge of a grassy bowl where there is a view of the village in the distance. It then swings south into the woods and continues its ascent, following a narrow ridgeline that leads to the steepest climb of the hike. 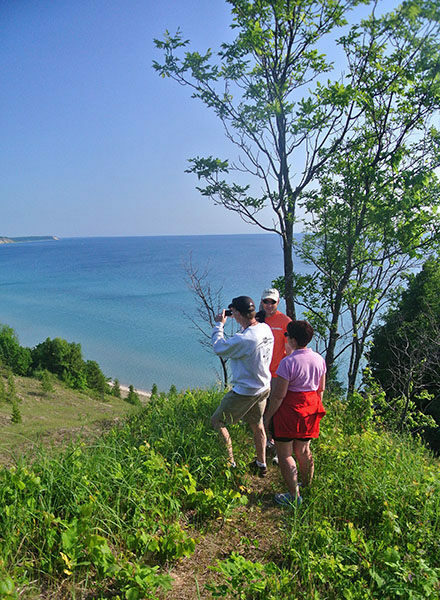 At Mile 0.5 you pop out of the trees on the edge of a huge, open blowout facing Lake Michigan. A trail to the west (right) continues a short distance to a small knob with views of the shoreline to the south. The trail to the east (left) climbs a bit higher for a different perspective of Lake Michigan and the surrounding dune country. At either, you can take a well-earned break and savor the scene below. Leading down through the open bowl is another unofficial path that descends towards the beach. Keep in mind that the bowl becomes an extremely steep slope before you reach Lake Michigan. It's important to note that the Elberta Dunes South trail is an uphill climb and that there is no source of drinking water at the trailhead. Arrive with a full quart per person in the summer. There is are no vehicle entry fees at Elberta Dunes South. The nature preserve is open year-round. Elberta Dunes South is posted along M-22 (also labeled Frankfort Avenue) in Elberta, less than a mile south of where the state highway crosses the Betsie River.